The bed side rail and support helps in many ways. 1. It prevents the sleeper from rolling off the bed and falling. 2. 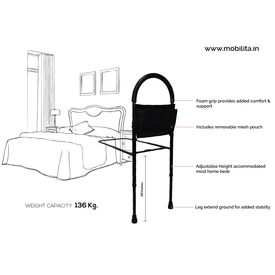 It provides a firm hold for the user when getting up from bed. 3. Provides a convenient place to keep small things, such as TV remotes, essential medicines, spectacles, or even a book. It is an ideal gift for a elder person. 1. No drilling or modification required. The flat base can be inserted under the mattress and strapped tightly to the cot. 3. Height adjustable, so it is suitable for all beds. 4. Foam handle for better grip and comfort. Your Mobilita branded product is warrantied to be free of defects in materials and workmanship for the product of the original consumer purchaser. This device was built to exacting standards and carefully inspected prior to shipment. This Warranty is an expression of our confidence in the materials and workmanship of our products and our assurance to the consumer of years of dependable service. If you have a question about your Mobilita device or this warranty, please contact an authorized Mobilita dealer. The bed side rail and support helps in many ways. 1. It prevents the sleeper from rolling off the bed and falling. 2. It provides a firm hold for the user when getting up from bed. 3. Provides a convenient place to keep small things, such as TV remotes, essential medicines, spectacles, or even a book. It is an ideal gift for a elder person. Features 1. No drilling or modification required. The flat base can be inserted under the mattress and strapped tightly to the cot. 2. Easy to install and remove 3. Height adjustable, so it is suitable for all beds. 4. Foam handle for better grip and comfort. 5. Ergonomically designed 6. Available in Black. Warranty Your Mobilita branded product is warrantied to be free of defects in materials and workmanship for the product of the original consumer purchaser. This device was built to exacting standards and carefully inspected prior to shipment. This Warranty is an expression of our confidence in the materials and workmanship of our products and our assurance to the consumer of years of dependable service. This warranty does not cover device failure due to owner misuse or negligence, or normal wear and tear. The warranty does not extend to non-durable components, such as rubber accessories, casters, and grips, which are subject to normal wear and need periodic replacement. If you have a question about your Mobilita device or this warranty, please contact an authorized Mobilita dealer.